It’s early January and, as usual, we’re getting inundated with seed catalogs. We get great enjoyment from browsing the latest offerings of seeds and plants, planning our upcoming garden, and dreaming about the warmer weather and bushels and bushels of fresh produce we’ll grow and harvest. As in past years, there are a few new varieties here and there that we want to try, along with plenty of old favorites. What you might not know is that MANY of these are perfect container grown vegetables…..yes, they grow well in pots! Some of the newer varieties give container and greenhouse gardeners more options for what they can grow in a limited space. For example, did you know you can grow things like watermelon and butternut squash in a container inside of your greenhouse? But, first things first. Planting a great container vegetable garden requires great seeds. So today, we thought we’d highlight a few of these options. Before we get to it, a short disclaimer; we’re not endorsing any of these seed/plant varieties or the companies that sell them. We’re just letting you know about these options and where you can get them. Some of these seeds/plants may be offered elsewhere, in addition to the seed companies we listed. Be sure to shop around. Finally, we didn’t include tomatoes and peppers on this list, as they are already popular container grown vegetables. Mascotte Bean – This is a bush bean that grows quite compactly, with plants averaging just 17″ tall. Mascotte beans are advertised as being slender, French-style beans with white seeds. Offered by Territorial Seed Company and Park Seed. Minnesota Midget Melon – This cantaloupe variety produces small fruit, averaging just 5″ across, on small, compact plants that are perfect for containers. Available from Territorial Seed Company and Burpee. Caracas Hybrid Carrots – These carrots reach just 5″ into the soil, making them perfect for containers. The carrots are sweet and full of flavor. Available from Burpee. Oxheart Carrots – These carrots get huge, often weighing 1 pound or more. They are short and wide, going just 6″ deep, making them great containers grown vegetables. Offered by Territorial Seed Company. Atlas Carrots – These carrots are almost round and reach about the size of a golf ball. Need containers just 4″ deep to grow these. Offered by Park Seed. On Deck Hybrid Sweet Corn – These corn plants feature super sweet, bi-color ears that average 7-8″ long. The plants average 4-5 feet tall. Offered by Burpee, who suggests to plant 9 seeds in a 24″ round container. Bush Champion Cucumbers – Offered by Burpee, these cuke plants average 1/3 the size of regular cucumber vines. They produce 10″ slicing cucumbers with some disease resistance. Spacemaster Cucumber – Offered by Burpee. Vines average 2 feet long and produce 7″-8″ green fruit. Good as container grown or in hanging baskets. Some disease resistance. We’ve grown these in the past with good results. Patio Baby Eggplant – This eggplant produces egg-shaped fruit that average just 3 inches long on a plant that remains less than 2 feet tall. You can get seeds or plants from Territorial Seed Company and Park Seed. Baby Bubba Okra – This okra plant is only half as tall as other okra varieties, so it might reach 3 feet high. Ready to harvest in just 53 days, it’s a good option for northern gardeners who want okra. Produces full-sized pods. Available from Burpee. Green Fingers Okra – Offered by Park Seed, this okra variety reaches just a couple of feet tall and produces full-sized yields. Peas-in-a-Pot Peas – This pea plant produces green shelling peas. Plants average just 10″ tall and can be grown in 8″ pots. Offered by Burpee. Little Gem Lettuce – This butterhead variety features heads that average just 5″ across. Ready in just 50 days. Offered by Park Seed. Ketchup ‘N’ Fries – This is the first thing that caught our eye this year. This plant was first offered last year in the UK and is now being offered in the USA this year by the Territorial Seed Company. Basically, it’s a cherry tomato plant that has been grafted onto a potato plant. The idea is that the top of the plant produces cherry tomatoes, while the roots produce potatoes. These are perfectly suited for growing in a pot, but they’ll also grow in the ground. Sugar Pot Watermelon – This bush plant averages just 18″ across, but produces 8-10 pound watermelons. Offered by Territorial Seed Company. Butterbush Squash – This squash plant produces butternuts that average around 1.5 pounds. Their vines reach just 3-4 feet long, making them good for a container. 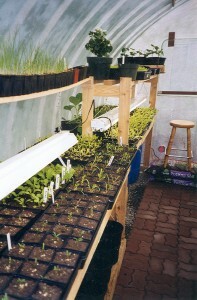 Seeds are offered by Territorial Seed Company. Discus Bush Buttercup – This is winter squash grows on bushy plants that reach 3 feet across – perfect for a large pot. The squash averages 3 pounds. Offered by Territorial Seed Company. Burpee’s Butterbush – This butternut variety features plants that average just 3 feet long. Each plant produces 4-5 squash averaging 1.5 pounds each. Available from Burpee. We’re personally grown these and had good results. Tivoli – This version of spaghetti squash averages 3 feet across and works well when container grown in large containers. The fruit averages 9-10″ long, weighs around 4-5 pounds and tastes and feels just like spahgetti squash. We grew these last year and had good results. Offered by Burpee. Burpee’s Bush Table Queen Squash – This is an acorn squash plant that reaches just 3 feet across. The squash have a classic acorn shape and average 4-5″ across. Offered by Burpee. We have grown this variety in the past, with good results. Patio Star Zucchini – This zucchini variety produces full-sized squash, but it only grows about half as big as a regular zucchini plant. Available from Territorial Seed Company. Partenon Hybrid Zucchini – This zucchini variety averages 3 feet across and produces 8″ long squash. This is a parthenocarpic plant, so the fruit is produced with pollination, making it perfect for your greenhouse. Available from Burpee. We hope you’ll consider trying a few new container grown vegetables this year in your greenhouse, and maybe some of these varieties will be just what you’re looking for. Got vegetable gardening questions? Post yours on the Solar Gem Greenhouses Facebook page, and I’ll be happy to answer them.